We Start our shave ice Using A block of ice made with filtered water and shave It into fluffy snow, not crunchy snow cone ice. All of our syrups are handmade with filtered water, premium concentrates, purees, fruits, and flavors. We Always Use pure Hawaiian cane sugar, never high fructose corn syrup. Book us at your next event. There is no fee to you. We show up, sell delicious shave ice, and your organization receives 20% of the total revenue. Help spread the word through flyers, emails, social media, etc. It's that easy! We are 100% self-contained, fully insured, and fun for everyone! *Due to the amount of requests we receive, fundraising is limited to organizations that directly help children or animals. There is a minimum of $300 in sales for a 2 hour window before a donation is given, approximately 75 servings. Please contact us to see if your event qualifies for a fundraiser. Hire the Shave Ice Truck for your party! 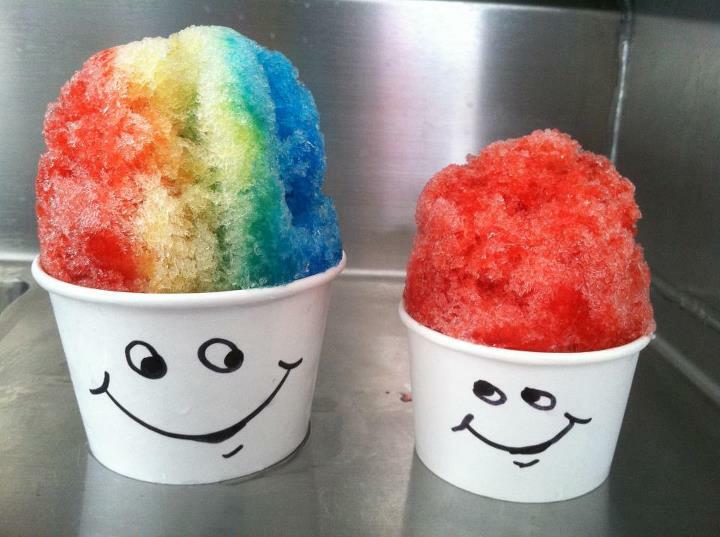 Los Angeles Shave Ice has been catering the Los Angeles area since 2010. Our love of high quality, gourmet shave ice has helped us become one of the best dessert trucks in town. We offer a wide variety of flavors and toppings along with the expertise and experience we draw upon in order to best meet the needs of our clients. We specialize in customizing our services and tailoring them to fit your specific needs. Our staff is highly experienced, clean, and friendly. Let us take care of dessert so you can enjoy your event and focus on your guests. Small size shave ice, includes 30 syrup flavors. Guests choose 1 flavor per serving. Toppings not included. Would you like to treat your guests with delicious shave ice, but you can't have a truck at your event? Let our catering team set up a shave ice bar. We will take care of all set up and clean up - hassle free. You can even customize the look to go with your theme with your own table linens, flowers, balloons, or other decorations. Select 12 flavors of your choice or let us pick for you. We will provide your guests with the same high quality shave ice you get from the truck. We have experience working with many studios including Disney, Sony, Fox, Warner Bros, Paramount, Quixote, ABC, NBC, and CBS. We understand the fast changing schedules and the last minute bookings. We are fully insured, on time, and very professional. We are completely considerate of your privacy and will never disclose any information on social media. "Today we had LA Shave Ice cater my sons birthday party, best decision we could have made! " "They arrived early and even gave me a couple "to go's" for my guests who were running late. You guys rock! Thank You so much LA Shave Ice!" "I hired Los Angeles Shave Ice to stop by my house for an hour during my wife's 40th b-day party. They showed up on time, was super pro, and the shave ice was delicious. All the guests loved it.... Highly recommended!" Shave Ice is fun for Birthday Parties, Bar/Bat Mitzvahs, Weddings, Baby Showers, Luaus, Employee Appreciations, Church Events, Colleges, School Carnivals, Festivals, Sporting Events, TV & Movie Productions, and more!